This article is about the dog breed. It is not to be confused with Coolie. Australian Koolies have been recognized on the Australian Sporting Registrar, the American Herding Breed Association's Registrar, the New Zealands Obedience Registrar and the Finland Herding Association. Koolies registered with the Koolie Club of Australia are accepted to the Canine Control Sporting registers in Victoria, New South Wales and Queensland. The Koolie (also known as the Australian Koolie or by the misnomer German Coolie) is an Australian dog breed. The Koolie is a working or herding dog which has existed in Australia since the early 19th century when it was bred from imported British working dogs. Robert Kaleski, in an article on Cattle Dogs in the August 1903 issue of the Agricultural Gazette of New South Wales, describes the "Welsh heeler or merle, erroneously known as the German collie," as a "blue-gray dog about the size and build of a smooth-haired collie, generally with wall eyes." The British background predominated in the dogs that came to be associated with the "German collie" name. The Koolie is a 'hearding dog', one which has a natural instinct to cast out (i.e., circle widely), round sheep and bring them back to their owner. Koolies are known as silent, upright, working dogs. They are used for "hearding" sheep and also for quiet careful work at close quarters at lambing time or for "shedding" (cutting out) sheep. The Koolie coat ranges from short/smooth (like that of the original blue merle Collies from Scotland), short (like a working Kelpie), medium and, not common, long (like the show Border Collie). Koolies are typically slightly longer than tall. The majority of owners prefer the short/smooth coats as they do not pick up grass seed, and are very easy to maintain, with the occasional swim to keep the coat glossy and free of parasites. Koolie colours can be solid (all one colour black or red/chocolate (this includes Koolie who are cryptic merle: carry the merle gene but do not display it obviously)) "bi" (black & white or red & white) "tri" (solid red or black, with white markings, normally with brown points), or "tri merle" (same description but merle) "merle" (grey, black, red/chocolate or white undercoat with large splashes of darker colourings of red/chocolate for red merles or black/grey for blue merles). Black Koolies will commonly have a black nose with black eyes, or tones of black including blue. Red or chocolate Koolies will commonly have a red or chocolate nose with brown eyes, or tones of brown, including yellow, and there can be combinations of both black or brown with the added blue eye/s. There are also dilute colours of slate or gun metal grey for black Koolies and fawn for Red Koolies. Also there is a yellow or cream colour created by the E,loci which is a masking gene and covers a red/chocolate Koolie to make it appear yellow/cream, this gene will also cover any merle, so it is advised that great care be taken and DNA testing done to discover if the E,loci is present before breeding. The same advice is given with relations to the dilute gene. Graziers, stockmen and dairy farmers across Australia since days long past have typically selected breeds which display the abilities required to meet their working needs. The temperament found in a Koolie is a culmination of these much sought-after abilities. The optimal worker possesses a combination of working skills and bonding temperament. The median longevity of Koolies is about 18 years, which is a typical lifespan for this breed. Koolies have a diverse gene pool and so do not suffer from the many genetic problems found in recognised breeds, but the merle for which the Koolie is most recognised by can, and does, produce blind and/or deaf white pups. It is highly recommended that, when considering breeding, matings of merle to solid are the safest option. In 2003 DNA testing carried out on 56 individual Koolie bloodlines from Australia by Dr. Mark Neff of the University of California at Davis in the USA cleared those bloodlines tested for the presence of the mutant gene mdr1-1, which causes malfunction in the canine multidrug resistance gene; Collie bloodlines were chosen to be tested because they showed a reaction, even death, to chemicals, such as Ivermectin, used in the treatment of intestinal parasites. In 2004, the Koolie Club of Australia in conjunction with Genetic Science Service of Australia launched the collection and processing of Koolie DNA, which continues to test for all current Collie diseases and family relationships. To date, the Koolie Club of Australia's database records show that their registered Koolie breed is relatively free of common genetic disorders that are found in recognised pure breeds, thanks to DNA testing. It is generally accepted that this is due to the natural breeding selection, which has continued unhindered for over 160 years. In 2008, Koolies registered with the Koolie Club of Australia have undertaken a breed specificity test to identify the Koolie genetically, the results will help discover and create stronger bloodlines. In 2010, the Australian Koolie's own unique signature gene is discovered through ASAP laboratories in Victoria, Australia, by Dr. George Sofronidis, making them the first Australian breed recognised by their DNA before the controlling canine body of their home country. In 2012, the Australian Koolie breed became a recognised member of the Veterinaries Genetics Assurance program. A Red Merle koolie backing sheep. Koolies are much sought-after in rural Australia, and interest is now being shown in America, Canada, Germany, Finland, New Zealand, Switzerland and Holland. According to Geoff Broughton, past president of the Koolie Club of Australia for 7 years, the Koolie will head (move to the front or head of the stock to push them back towards you), heel or drive, (push the stock from behind), cast (move out and around the stock), block (hold the stock or block them from in front, in three sheep trials this action is called the pick up) and back (literally jump onto the backs of their charges to herd them if necessary). Koolies have a reputation for being upright workers with a good eye, who can easily shift their focus from holding the group to casting around a flock or gathering breakaways. They are not known for having "sticky eyes" (focusing on the sheep in front only). Unlike other working breeds, which are noted for their crouched form or style and preference for either yard or field work, Koolies are at ease working in closed surroundings such as yards or trucks and being out in paddocks and droving. As well as working anything from ducks to bulls, like all dogs of their kind they will herd family members and children in the absence of other charges. Herding instincts and trainability can be measured at non-competitive herding tests. Koolies exhibiting basic herding instincts can be trained to compete in stock dog trials. The Koolie's ancestors were the smooth coated blue merle Collie (imported from Britain in the 19th century) and the Black and Tan Collie from the Highlands of Scotland; these were the same type imported by Thomas Hall for the creation of his Heelers. The Koolie is believed to be descended from the same Collie types that were brought to Australia for the kennels of Thomas S. Hall (an originator of the Australian Cattle Dog breed); some believe that they could be direct descendants of Hall's dogs. While some believe the 'German Coolie' to be descended from the 'German Tiger', a European herding dog, there is no genetic or even anecdotal evidence to support this claim. A more plausible theory is that these dogs were used by German immigrants in South Australia who, unable to correctly pronounce 'collie', referred to the dogs as 'coolies'. Others have noted strong similarities with the Australian Koolie and the Welsh Collie, another British herding subtype. According to older Koolie breeders personal records, from diaries and photo albums the Koolie has been around for over 160 years. 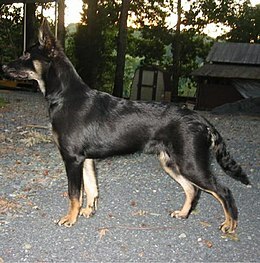 During the industrial era some bloodlines were influenced by Kelpie and Border Collie, as explained by one grazier in Western Australia, "You bred from the good workers which were around and Koolies were not always to be found, so you bred to the next best worker that was and this was either the Kelpie or Border depending on the region you lived and the stock you worked". In 2000, the Koolie Club of Australia was formed to preserve, protect and ethically promote the Koolie breed. The Koolie Club does not actively work towards bench standard recognition, feeling this would only be detrimental to the breeds working future. As of (2013), no bench standard exists. In 2004, the Koolie breed was recognised by the Australian Sporting Registrar, judges from the Australian National Kennel Council (ANKC) may judge Koolies in all ANKC sanctioned sporting trials. In the states of Victoria, New South Wales, and Queensland, registered Koolies may compete in, herding, obedience, tracking, jumping, gambles and dog agility events through registration on their State's Sporting Register as members of the Koolie Club of Australia. In May 2006, the Stockdog Committee of the Australian Shepherd Club of America voted to accept the "Koolie/German Coolie" into their list of recognised and accepted herding breeds, admission was granted June 2006. In 2006, The American Herding Breed Association accepted the Australian Koolie onto their list of recognised and accepted breeds. In 2002, the first exportation to America of a registered DNA tested Koolie were orchestrated by members of the Koolie Club of Australia, for Ms Torry Lynn Revels of North Carolina, USA. In 2003, at the Koolie Club of Australia's Annual General meeting a unanimous vote was returned to appoint Ms Revels the clubs official representative in America, Ms Revels was instrumental in gaining acceptance of the Australian Koolie to the recognised breeds lists of the American Herding Breed Association and the Australian Shepherd Club of America in order to gain qualifying scores in herding trials. In 2008, the first exportation to New Zealand of a registered DNA tested Koolie were orchestrated by members of the Koolie Club of Australia, for Ms Penny Nalders of Wellington, New Zealand. In 2008, the first exportation to Finland of registered DNA tested Koolies were orchestrated by members of the Koolie Club of Australia, for Ms Sinikka Kumpusalmi of Vehmersalmi, and Mrs Satu Tasanen of Honkilahti, Finland. In 2011, the first exportation to Switzerland of registered DNA tested Koolies were orchestrated by members of the Koolie Club of Australia, for Ms Brigitt Stirnimann of Aarwangen, Switzerland. ^ "Welcome to the Australian Shepherd Club of America". Australian Shepherd Club of America (ASCA). Retrieved 22 July 2008. Aleta Curry (2003). "The All-Australian Dog: The Koolie", one of a series of articles appearing in The Southern Village View Magazine, © 2003. Wikimedia Commons has media related to Koolie. This page was last edited on 27 March 2019, at 23:48 (UTC).